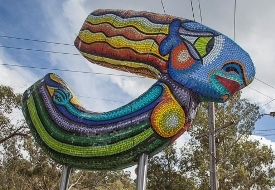 Deborah Halpern – Queen of the Shire, coloured glass tiles, fibreglass, aluminium, steel. Size: 470cm x 320cm x 50cm. MAANZ member Deborah Halpern’s Queen of the Shire embodies the creative spirit of Nillumbik, a spirit that has been forged by a dynamic artistic heritage, inspired by the region’s landscape, history and its people. The Queen’s sweeping form and vibrant colours reflect the local landscape-the blue and russets of skies reflected in th Yarra River and the varied greens and yellows of the bush. Queen of the Shire is located at the Cnr Kangaroo Ground-Warrandyte Rd & Research-Warrandyte Rd North Warrandyte. Please make sure that all your artwork has an adequate hanging system according to weight and substrate and follows the guidelines. Artwork without this won’t be exhibited. Hanging work must be prepared for exhibition with D-Rings and strong cord or wire. Your 2 D-rings (one on either side of the back of your work) should be located to enable your work to hang flat. This is usually with the screw of the D-ring 10cm from the top edge of the work, with the screw 5cm in. Strong cord or wire should be used and strung tight. D-rings must be screwed into or through the substrate and NOT glued on. You can purchase D -ring from any good framer or online from www.artscene.com.au. Search for Framing/metal D ring under the code section. There are different strengths available for heavier pieces. DO NOT use the cheap triangle shaped ones from the hardware as they break easily. Please Note: MAANZ will not take responsibility of damaged hanging mosaics due to inadequate hanging system. If you use Marmox, Wedi or any other lightweight substrate boards you must attach the hanging system the correct way. This most likely has to be done before gluing tesserae down, because the screws have to go through the board and fastened with washers. The correct way of doing it can be downloaded here. You also can buy these substrates already with the fixings attached. Many suppliers have a D-ring system already secured to the boards. Please also make sure that your artwork has FELT PADS (not silicon) attached to the back.